As he did in making his debut feature Ballast, Lance Hammer ignored all the conventional rules when he released the film last year. 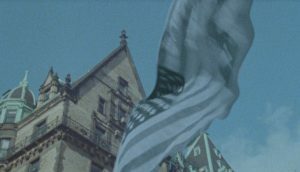 Originally slated to be opened by IFC Films, Hammer — known best for his work in the visual effects department of Hollywood pictures like the Batman films of the Joel Schumacher era — rethought his decision and came to the conclusion that it would be better to self distribute the film. Though the attention of his dramatic move led to more ink about the self-distribution/DIY model than any other time in recent memory, it’s still hard to determine if it was the best move for Ballast (and this isn’t the proper forum to explore that). The film received instant respect from critics when it played at Sundance in 2008 and walked away with the awards for Director and Cinematography (for the splendid handheld 35mm camera work of d.p. Lol Crawley). It highlighted a different type of Sundance film as Hammer wasn’t looking for a meal ticket to bigger-budgeted filmmaking. 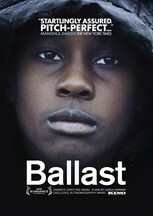 With no score, using untrained or unknown actors and a European aesthetic influenced by the works of the Dardenne brothers and Robert Bresson, in some ways Ballast is a blueprint of the recession-era filmmaking we’re currently in — a film that can find attention without the backing of the now extinct mini-major distributor. Exploring the splintered relationship of a family living in the Mississippi Delta, we come into the story at the family’s lowest point. Twin brothers, Lawrence (Michael J. Smith Sr.) and Darrius, are in a rut and Darrius has committed suicide. Lawrence is soon to follow but a neighbor, who has found Darrius, hears the gunshot Lawrence has inflicted on himself and gets him help. Lawrence awakens ten days later to return home alone to a two house property he and his brother shared. Hammer then moves his attention to Darrius’s widow Marlee (Tarra Riggs) and her son James (JimMyron Ross). We learn Marlee was into drugs and might have drove Darrius away. She’s now trying to repair her life while in the mean time James is left to fend for himself, spending his time playing video games and hanging with drug dealers. Darrius’s death forces the three to come back together and through time the relationship begins to mend. But Hammer doesn’t spoon feed sappy moments or heartfelt apologies. Instead the film (which warrants multiple viewings not just to marvel at the gorgeous visuals, but catch the plot points) gives a tone and mood similar to the season in the Delta. Dreary and cold with the hope of brighter days to come. Disc includes an essay from Amy Taubin, and a breakdown of the improvisations of some of the key scenes in the film. Sadly, there isn’t a director commentary or feature on the film’s cinematography. Hopefully that will come in a future version. Kino releases the DVD today. Subscribe now for a digital issue to read our interview with Hammer in the Fall 2008 issue.